When I ask new students what “positive reinforcement” means to them, most say something along the lines of “rewarding good behavior.” That’s a perfectly good layman’s definition, and a great place to start. But in training as in life, the devil is frequently in the details. First, a terminology nitpick: Reinforcing a behavior is different from rewarding it. Rewards don’t always work—anyone who’s ever been an employee anywhere can think of an example to support that. But reinforcers always work—because by definition, a reinforcer is anything that, as a consequence of a behavior, increases the future probability of that behavior. If a reward doesn’t have that effect, it’s not a reinforcer for that learner. 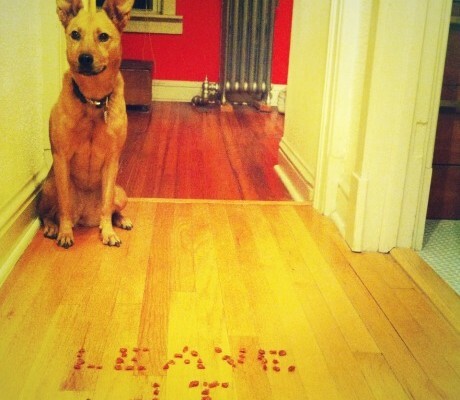 “Leave it,” a behavior taught with positive reinforcement and, initially, lots of preventive management. Reinforcement makes behavior more likely. Put another way, it makes behavior stronger—gives it mass, which in turn gives it momentum, or resistance to obstacles in its path. This has great ramifications for how we teach and train. If we want to add mass to a behavior, we must make sure the behavior gets reinforced a lot. And if we are hoping that this behavior will replace a less desirable option—say, sitting over jumping—we also need to ensure that the other behavior does not get heavier. Think of two of the options a dog has when visitors arrive, sitting and jumping, as occupying two sides of a scale. If jumping on visitors already has 100 pounds of reinforcement on the tray, you’ll need to put at least 100 on the side of sitting around visitors just to have a 50-50 chance that your dog will sit instead of jump. You’ll also want to avoid putting any more weight on the jumping side, because if you do, you’ll have to go back and put that much more on the sitting side just to even the odds. Good trainers rig the game so the dog wins as often as possible. We want to make it reasonably easy for the dog to repeatedly earn reinforcement for the right behavior, or when we are shaping a complex behavior, for achievable steps in the right direction. Errors may happen, but you might be surprised to discover that, contrary to common popular belief, they aren’t necessary for learning. We don’t need to set the dog up to make mistakes so that we can correct him. (When you’re trying to shake a nicotine habit, do you leave a pack of cigarettes on your desk so you can beat yourself up if you sneak a smoke?) We need him to have a big fat history of reinforcement for the new behavior. When training plans don’t work, it’s often because even though mass for a new behavior is being built up, an undesirable choice is still being reinforced as well. The dog is taught to sit, but while the sit is is being shaped up for the necessary duration and resistance to distraction, the dog is not prevented (proactively, by leash, gate, or crate) from jumping on visitors. So jumping continues to reap reinforcement, often in the form of information, attention, and/or affection. A puppy is regularly marched out into the snow to eliminate, but also left unsupervised between potty trips to pee in the comfort of a warm house. A dog is reinforced for walking by the owner’s side when the owner remembers to bring treats, but when the owner is late for work, he leaves the treats in the cabinet and follows the dog down the sidewalk on a tight leash—a behavior reinforced by access to a slate of reinforcers so powerful that some dogs will endure choking and electric shock to attain them. So remember, there are at two key parts to any good training plan: reinforcing the behavior you want, and preventing reinforcement for the behavior you don’t. The two combined are the fastest way to tip that scale. Kiki Yablon can be reached directly via Dog Training by Kiki Yablon.